FYR Macedonia have appointed Croatian Ivica Obrvan as the national team coach after his predecessor, Zvonko Šundovski, stepped down following the 2013 World Championship in Spain in January, Macedonian Handball Federation (RFM) president Živko Mukaetov announced on Friday (15 March). 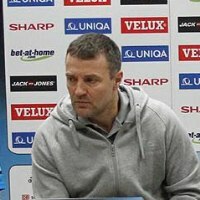 Obrvan, who won the EHF EURO 1994 bronze medal with Croatia as a player before coaching Slovenian club Gorenje Velenje and then Zagreb Croatia Osiguranje, faces an imminent test of his credentials when FYR Macedonia twice play world champions Spain in a EHF EURO 2014 qualifying doubleheader in the first week of April. "We have picked Obrvan with the joint ambition of reaching EHF EURO 2014 in Denmark and although it’s a specific situation, we are convinced that we are good enough to achieve that objective," Mukaetov told Macedonian media after Obrvan’s official promotion. FYR Macedonia are second in Qualifying Group 1 with two points from as many games after beating Switzerland at home and then suffering a defeat at Portigal, meaning that they face a tough road to Denmark and one littered with thorns rather than paved with roses. Obrvan was grateful for the opportunity to coach the team that exceeded expectations when they finished fifth at the EHF EURO 2012 in Serbia. "I wish to thank the RFM for entrusting me with the job and I hope that the team will live up to high expectations and reach the EHF EURO 2014 in Denmark," Obrvan told his inaugural press conference in Skopje. "I have a very good insight into FYR Macedonia’s handball at club and international level because I coached Zagreb last year, when we played several matches against top Macedonian clubs, Vardar and Metalurg," he pointed out. Obrvan acknowledged, however, that he faced a race against time to make sure that FYR Macedonia were at their best for their upcoming double challenge against Spain. "It’s difficult to bring about drastic changes and make rapid improvements in only a few training sessions so my first priority will be to build the kind of team spirit that will ensure we produce top performances on the big stage. "We know Spain are the world champions but we will head into the games aiming for a win, hoping that hard work will eventually bear fruit," FYR Macedonia’s new coach emphasised.